These days, people all over the world commemorate the founding of the United Nations 70 years ago. On 24 October 1945, the UN Charter entered into force and a new international organization was born out of the ashes of the Second World War and the Holocaust. Today, commemorating the UN is often an occasion to question its continuing relevance, and stress the need for its wholesale reform. Even UN enthusiasts are resigned; the best argument put forward is usually along the lines: there is no alternative to this universal international organization that provides a forum for world leaders, an authority on international norms, and a lifeline for millions affected by conflict, poverty, and disease. The atmosphere was decidedly more upbeat at the recent commemorative event organized by the United Nations Association UK (UNA-UK), the civil society organization in the United Kingdom devoted to the United Nations. Bringing together around 1,000 guests in the medieval Guildhall in central London, the discussions and keynote speech underlined the nature of multilateral diplomacy. 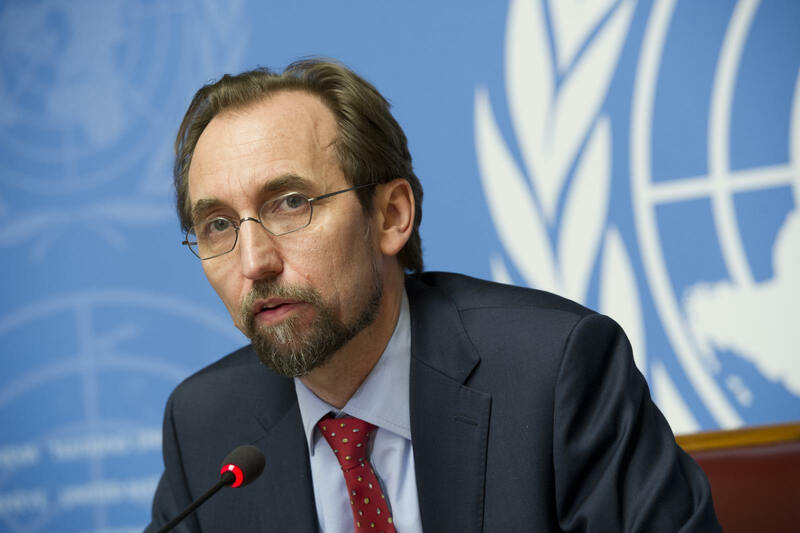 It is the art of the possible and often up to individuals, exploring the opportunities that lie in “the space between where your instructions end and you as a thinking negotiator invest your own thought”, High Commissioner for Human Rights Zeid Ra’ad al-Hussein said once to The New York Times. His remarks at the event reflected this insight, just as much as the thorough recommendations from Gro Harlem Brundtland, former Prime Minister of Norway, and Hina Jilani, Pakistani Supreme Court Advocate in the panel discussion preceding the High Commissioner’s keynote. Both are members of The Elders, an advocacy organization on peace and human rights founded by Nelson Mandela. Holding such an event in London had a particular historic significance: Just a few miles from Guildhall, the UN General Assembly met for the first time on 10 January 1946 in Westminster Methodist Central Hall. The UN Security Council followed a week later, with a meeting in Church House in Westminster, London. Seventy years later, everyone agrees that the UN needs reform, but opinions diverge how that can be achieved. Three examples highlight areas where consistent advocacy and careful negotiations can advance the overall effectiveness and legitimacy of the United Nations and its work: electing the new Secretary General, the use of the veto in the Security Council, and transitional justice in Sri Lanka. At the end of next year, the UN will choose a new Secretary-General, as Ban Ki-moon’s second term comes to an end. Traditionally, the five permanent members of the Security Council have decided on the final candidate just by themselves, without public debate, campaigns, or any meaningful inclusion of the General Assembly which could only confirm the lowest common denominator candidate the five powers could agree on. Improving this process is important, as Gro Harlem Brundtland outlined, as the Secretary General can prove an influential normative leader. To be able to work for the world community, he (or she!) needs to be independent and impartial, and all countries need to have the feeling that the Secretary General represents their common interest. For this purpose, UNA-UK started the 1for7billion campaign. Its objective is to make the selection process of the Secretary General more transparent, including encouraging member states to suggest candidates that would run on an open platform, spelling out official criteria for the selection, informal meetings with the candidates by the General Assembly, and encouraging a female candidate. Unrealistic? Requires a charter change? Actually, on 11 September 2015, the General Assembly adopted a resolution outlining all of the above principles. Activists, including The Elder member Brundtland, would like to see further changes such as limiting the term of the SG to one, non-renewable seven-year term, and the actual submission of more than once candidate by the Security Council to the General Assembly. Still, the 1for7billion campaign is a primary example how a civil society-led campaign can push the boundaries of multilateral diplomacy further. The issue of restraining permanent members from using their veto in the Security Council is a tougher nut to crack. The French government, as well as a group of member states called the “Accountability, Coherence and Transparency Group” (ACT) have assembled 73 member states behind their pledge not to use the veto in case of mass atrocities. Recently, the UK joined the French in signing up to the code of conduct for the permanent members, leaving the US, Russia, and China, which have all declared their opposition to the proposal. Here, The Elders member Jilani advocated that permanent members should at least be required to explain their position publicly, if they do decide to resort to the veto. This explanation could then provide the basis for further deliberation – and further pressure to find an agreeable solution. Lastly, High Commissioner for Human Rights Zeid delivered a passionate plea for the value of human rights in our time: refugees crossing a border illegally should not be regarded as criminals, he said. More than any other high-level official in the UN system, his office confronts him with evidence of the worst offences against ordinary human beings on a daily basis. Recounting a recent visit to Mexico, where he met with families of some of the 26,000 persons that have disappeared in recent years, he vented his frustration and despair: “It leaves you feeling empty”, he said. Still, “if we did nothing, the situation would have no chance of getting better”, he added defiantly. Transitional justice in Sri Lanka is a recent example what a careful diplomatic approach can accomplish. On 1 October, the UN Human Rights Council adopted a resolution, in congruence with the Sri Lankan government, recommending a host of measures designed to advance the process of reconciliation, accountability and non-recurrence more than six years after the end of the brutal civil war in the island nation. One particularly hard-fought issue was the inclusion of international judges in the judicial mechanism to investigate crimes and try perpetrators for international crimes. Despite its general openness to work with international partners on reconciliation and accountability, the new Sri Lankan government had promised its electorate at home that alleged perpetrators would only be tried by domestic judges. For the high commissioner, as well as the UK and the US as main sponsors of the resolution, the decades-long history of delayed and flawed trials for human rights abuses in Sri Lanka meant that some international element was going to be crucial to make the mechanism meaningful. After hurried last-minute negotiations, the Sri Lankan diplomats finally agreed to the “participation of… Commonwealth and other foreign judges” in the Sri Lankan mechanism. As Sir Jeremy Greenstock, chairman of UNA-UK, asked the High Commissioner whether he believed that this was actually enough, the latter pointed out that the Human Rights Council adopted his recommendations “almost in total” and that there was “immense legal expertise” in Sri Lanka. He is due to travel to the country until the end of the year to further clarify the implementation of the resolution. Public consultations for the election of the new Secretary General, a code of conduct for Security Council action in situations of mass atrocities, and redress for massive human rights violations during Sri Lanka’s civil war: three recent examples how diplomacy, pushed by strong civil society advocacy, can make a difference at the United Nations. In a time where public debate is dominated by the failures of UN member states in Syria and Ukraine, as well as of UN staff in the Central African Republic or Darfur, it is important to highlight the role of individuals and their actions in international crises. Given a window of opportunity, individual diplomats, senior UN officials and civil society activists can meaningfully contribute to make the vision of the UN Charter a living reality, bit by bit. Anyone who visits the United Nations headquarters in New York, is immediately immersed in the great variety of artworks on display on the premises. Many are gifts of member states, others personal ones by individual artists and some have even been collected by the organisation itself. 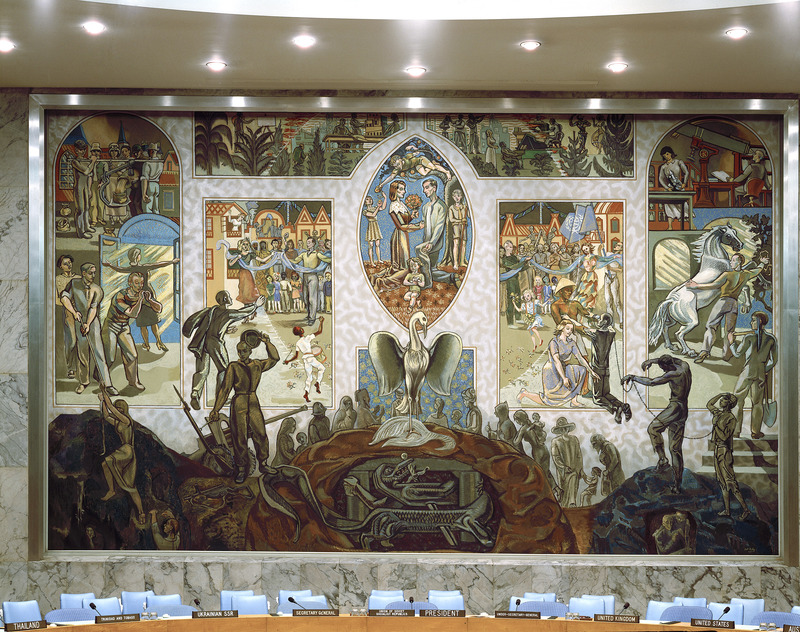 Per Krogh’s famous mural in the Security Council chamber, Picasso’s Guernica or Chagall’s stained glass window are just a few examples. Pieces of art are strewn all over the premises not just in New York, but at all UN stations, from Geneva to Tokyo, from Vienna to Nairobi. Frequently, they carry a strong political message underlining the donor’s or the artist’s idea for the improvement of its work. Astonishingly, however, the UN has treated them with little care, and social scientific research has largely ignored its existence. 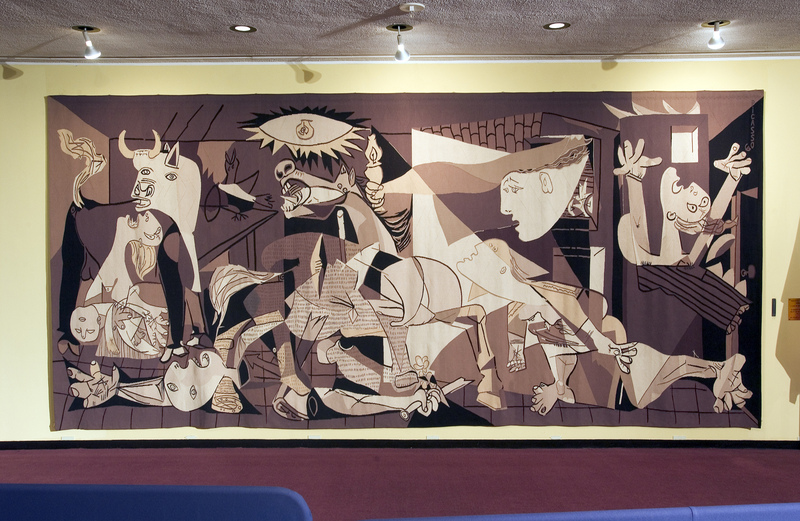 The main exhibit that one adjacent room had been fully dedicated to, was Alfred Banze’s project “H-O-P-E.” For this, he had travelled in Southeast-Asia, the DR Congo and Europe with a copy of Per Krogh’s mural from the Security Council chamber, asking local art students to produce short video clips inspired by the piece of art or the UN in general. The finissage of the exhibition brought him together with the curator Signe Theill, who discussed his journey and some of the more than seventy clips Banze later integrated in a digital version of the mural. The contributions differ widely in quality and message; quite a few are very critical of the United Nations’ work. One video from Kinshasa, for example, shows two men getting into a fight and ostensibly being killed by gunfire, while a sun-glasses wearing lady with UN blue helmed looks the other way. As this example shows, art associated with the United Nations is frequently highly political. Being an intergovernmental organisation, where member states meet to discuss the issues of the world, this does not, of course, come as a surprise. Especially those hundreds of pieces of arts that member states gifted to the UN carry important messages, many related to peace and international cooperation. There is, for example, the bronze sculpture “Let Us Beat Our Swords into Ploughshares,“ that the Soviet Union gave in 1959 to the United Nations. It seems quite extraordinary that the deeply atheist Soviet government would gift a sculpture entitled by a biblical verse. Or think about Iraq’s gift of a replica of the stele of Hammurabi in 1977: an autocratic regime presenting a symbol for the rule of law. Member states take the power of these symbols seriously, as evidenced by the infamous incident in 2003, when the UN covered its replica of Picasso’s Guernica, a strong symbol against war. Colin Powell was to hold its presentation on Iraq’s alleged possession of weapons of mass destruction in the Security Council and stand for a few questions regarding the possibility of US intervention outside the chamber, in front of the mural. As these examples testify, the artworks situated at the UN premises are worthy of much more attention, including by critical scholars. It seems odd that even the UN did not really take care of its art collection, with no single officer tasked to look over it. When it started the renovation of the New York buildings a few years ago, it discovered that it had lost a number of artworks. It’s not enough if news reports focus on the cost of new installations, as for example the cave-like ceiling decoration gifted by Spain to the United Nations in Geneva for the Human Rights Council chamber. Instead, social scientists should shine some light on the implications and meaning-makings at work. Member states try to form their international identity in physically lasting representations, diplomats discuss issues of global governance in front of (or beneath) powerful symbolic messages. Possible analyses could thus focus on critical examinations of the messages implicit to many artworks in comparison with the UN policies of the respective member states. Another focus could be on the kind of issue-areas, specific policies and notions for international cooperation that these pieces of art represent and how these compare with the stated goals of the United Nations.